My previous post went through the steps required to avoid GFI MailArchiver archiving spam emails from the journaling mailbox into the active GFI MailArchiver Archive Store. Currently, I have temporarily disabled the current “mails servers to archive” process which is maintained by GFI MailArchiver. New emails will therefore remain in the journaling mailbox of the Microsoft Exchange Server for the time being. Furthermore, I have created a spam retention policy in GFI MailArchiver so as not to archive more emails into the GFI MailArchiver Archive Store which have been marked as SPAM by GFI MailEssentials. But what if I do not filter spam emails with GFI MailEssentials? 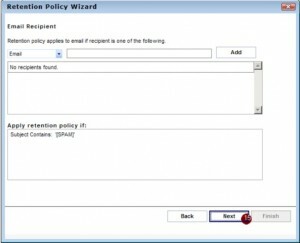 Will the spam retention policy still work in GFI MailArchiver? The answer is ‘NO’; so what can be done now? It depends. Are you using a 3rd party Anti-Spam Messaging solution that is able to mark spam emails in the subject field: e.g. “[SPAM]…”? If spam emails are filtered by a 3rd party Anti-Spam Messaging solution, then it is necessary to mark spam emails with a specific spam tag in the subject field. 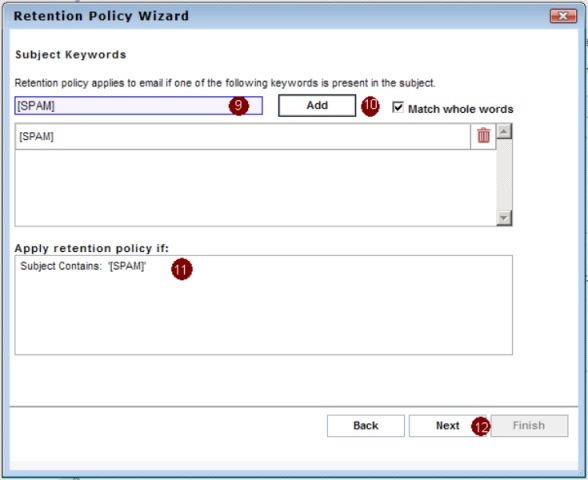 In my example the 3rd party Anti-Spam Messaging solution will tag the subject field of inbound emails which have been detected as spam with the keyword “[SPAM]”. GFI MailArchiver will now be able to make a difference between a HAM and a SPAM email by just looking into the subject field of the specific email that should be archived. By choosing the option “Add Retention Policy” (6) I will confirm that GFI MailArchiver will not archive any further emails into the GFI MailArchiver Archive Store which have been marked as spam by a 3rd party Anti-Spam Messaging solution. In my case I will select the option (6). 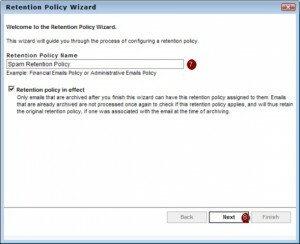 In the first form of the “Retention Policy Wizard” I will provide a proper name for the Retention Policy (7) and confirm the name of the Retention Policy (‘Next’ button) (8). 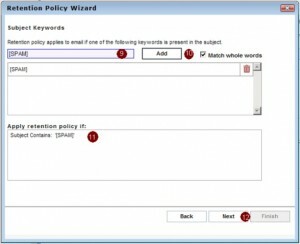 In the next form of the “Retention Policy Wizard” I need to determine the Retention Policy Condition which means that the retention policy will only apply if certain keywords appear in the subject field of the email that should be archived. (11). Enter the keyword [SPAM] in the field (9) and click “Add” (10). Per default the option “Match whole words” will be enabled. After adding the right keywords into the list confirm the selection (‘Next’ button) (12). 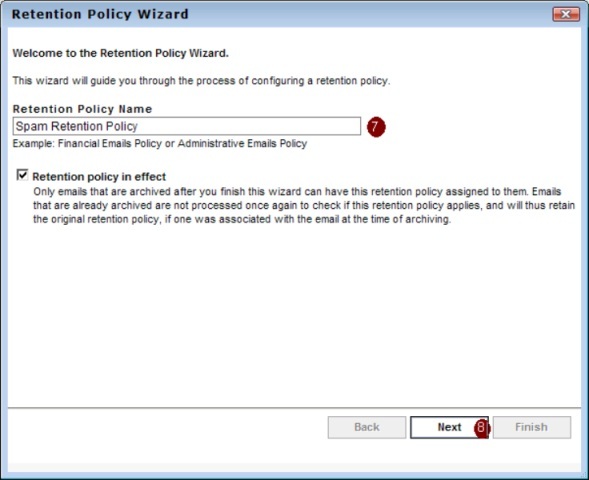 In the next three forms of the “Retention Policy Wizard” I can provide further conditions regarding “Body Keywords”, “Email Sender” and “Email Recipient”. It is allowed to use expressions such as “*@domain.com” or “j?? @domain.com” in the text fields for “Email Sender” or “Email Sender”. 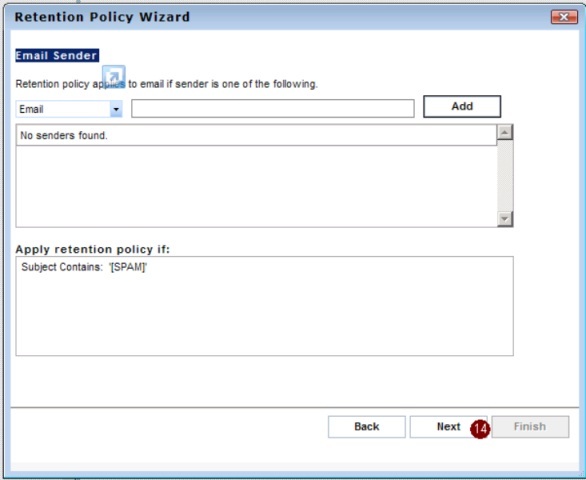 In the last form of the “Retention Policy Wizard” I need to determine the Retention Policy Action which means that spam emails should be deleted by GFI MailArchiver immediately or after X days (16). Per default GFI MailArchiver will suggest 30 days. After selecting the right option confirm the selection (‘Next’ button) (17). After this selection we have set up a Spam Retention Policy which takes immediate effect on all new emails which GFI MailArchiver should archive. Emails which have been marked as spam will not be archived in the GFI MailArchiver Archive Store or will be removed after X days from the GFI MailArchiver Archive Store.